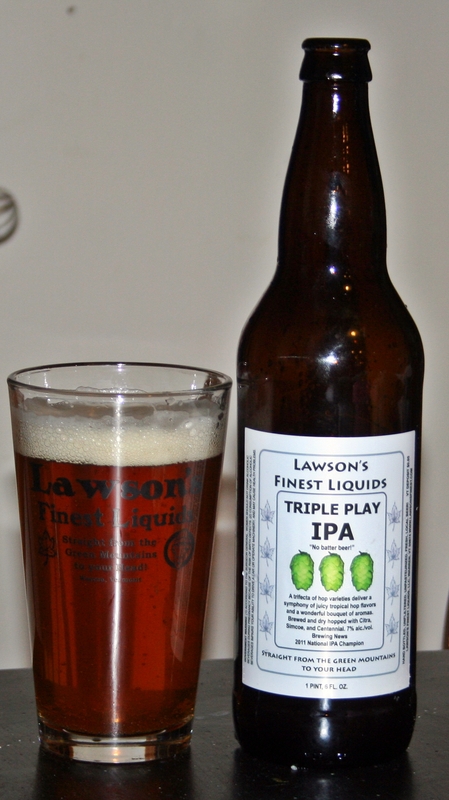 I am always excited when I find a bottle of Lawson’s Finest Liquids and even more excited when it is one of his hoppy beers. I grabbed this bottle at the Hunger Mountain Coop in Montpelier, there was a line of people waiting for Heady Topper to arrive and this was just sitting in the cooler. Appearance is a very clear deep orange with a thin off white head that left great lacing on the glass. Huge hop aroma with loads of citrus, tropical fruits. These follow through to the taste as well with just a hint of malt to keep it in balance. Overall this is what I want in an IPA and at 7% it is just shy of Double IPA classification. As usual really great stuff from Lawson’s so if you see it, buy it.